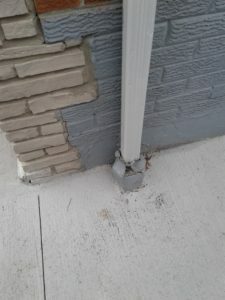 Downspouts should discharge above ground. Why you might ask? Well the answer is simple, we cannot see where the water is going. Is it connected to proper storm sewer? Is it discharging somewhere in the backyard? Is it maybe clogged with leaves? The easiest solution is for to discharge above ground, the further away from your building the better. Usually a minimum of 3 feet from building is recommended.